This is a family treasure which has been pampered since new with an open check book. 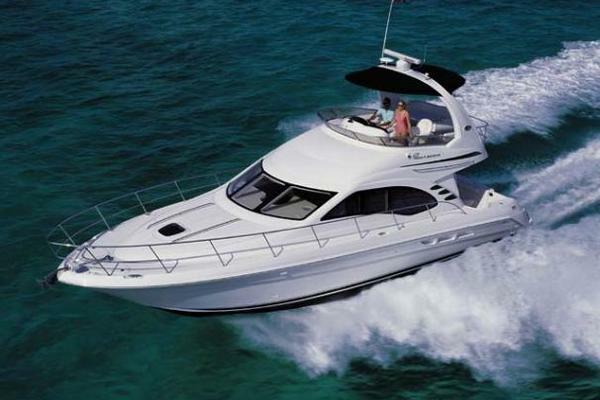 The family purchased the boat new and imported her into the Bahamas. That means that she is Bahamas Duty Paid and can stay in the Bahamas unrestricted making for a perfect base to pop over for the weekend when the fish are biting and back home to Monday morning's work grind. The water maker has 435 hours and the generator has 1600 hours. Designed and built with the same quality as Post Marine's 50 Convertible, the Post 42 is a smaller offshore cruiser with diesel power. There is cockpit engine room access through the deck house step. The 42's expanded bridge features full instrumentation, hydraulic steering, an L-shaped lounge with rod locker below, excellent storage, and more than ample room for a choice of custom electronics. The 42's richly appointed salon features designer fabrics and carpeting, a full entertainment center with 20-inch remote color TV, AM-FM Stereo and CD player, an L-shaped dinette with storage below, an L-shaped lounge with sleeper hideaway, teak coffee table, and exquisite joiner work. The master stateroom features a queen-size island berth with storage above and below and a cedar-lined hanging locker. The comfortable guest stateroom features over and under bunks with storage below plus hanging locker. The full head with enclosed shower can be entered from either the forward stateroom or the passageway. The 42's functional galley includes a two-burner electric range, microwave - convection oven, a full-size refrigerator and freezer with ice maker, and parquet flooring. Powered by reliable Volvo TAMD 74EDC engines with dripless shaft seals.